There’s so much more to Nordic food than pickled herring and meatballs. Stretching from the midnight sun of northern Norway to the flat, fertile fields of Denmark, Scandinavian food culture is a lot more varied than you might think. That said, several dishes and ingredients link all the regions together, bringing a uniquely Nordic food experience to life. That was created by thousands of years of heritage and shared culture. And a bit of Viking pillaging. Scandinavian food is simple. We call it husmanskost – farmer’s fare. It’s natural and honest, made with the staple produce found on the land. For ScandiKitchen, trying to turn traditional dishes into fancy and fussy affairs isn’t true to who we are. When you work with the very best produce, there’s no need to over complicate it. Just pick (or pickle), serve and eat. It literally means ‘buttered table’ – indeed, the Swedish word for sandwich is smörgås. An array of small dishes, both warm and cold, a traditional smörgåsbord starts with fish, moving on to cold meats, and then warm dishes. Cheeses come at the end. In Sweden, the smörgåsbord is always laid out in advance; in Denmark (where it’s called det kolde bord, or ‘the cold table’), dishes are sent to the table throughout the meal. A traditional lunch can take hours, and aquavit is enjoyed at regular intervals, of course. 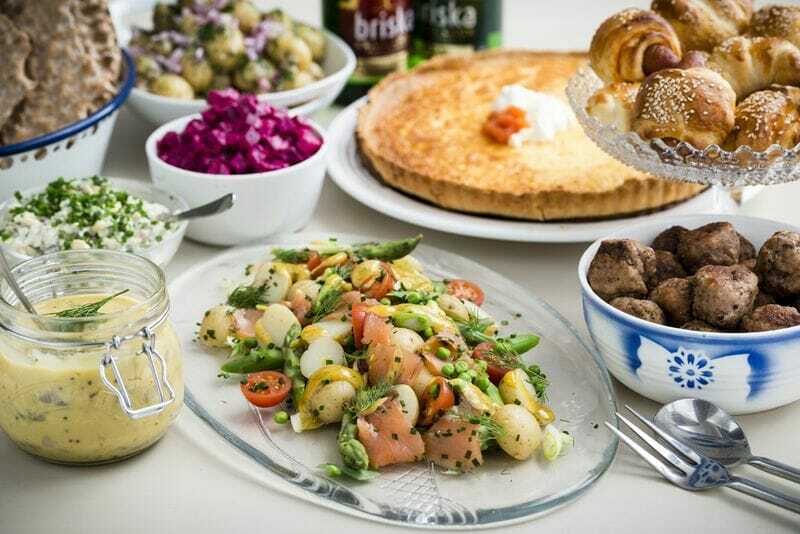 Popular dishes for a smörgåsbord include bowls of pickled herring served with rye and crispbread, beetroot and apple salad, meatballs, pâtés, and different types of cured and smoked salmon. You probably already know that our most popular fish is herring. We eat it pickled, but also smoke and fry it. Scandinavian varieties of pickled herring are less sharp than what you’ll find elsewhere in Europe, as the brine is sweeter. Any kind of cured or smoked salmon is also loved. Gravadlax (dill-cured salmon) is probably the most famous of these. Smoked mackerel is also served, as are less commonly known fish such as Arctic charr. Sweden celebrates the crayfish in August, with outdoor parties where we eat bowls of them washed down with aquavit. Pork is an important meat in southern Scandinavia. Flæskesteg pork roast, eaten with a heavy gravy and caramelised potatoes, is as Danish as roast beef is British – and is also the quintissential Danish Christmas lunch. Further north, game such as reindeer and elk is served – and it’s not difficult to find bear sausage in some places. Northern Norwegians eat a lot of smoked, dried lamb. Of course, we can’t discuss meat without mentioning meatballs. There must be tens of thousands of different recipes – actually, that’s probably a vast underestimation. In Sweden, a mixture of pork and beef is usually prepared, whereas Danes prefer pork and veal. In Norway, there’s more regional variation, but beef is popular. In Sweden, meatballs are small – and in Norway, they’re big. If you’re going to learn how to make meatballs, you’ll need to find a good, basic recipe and then put your own spin on it. Across Scandinavia, meatballs are usually served with potatoes, either boiled or mashed. If you’re looking for a Swedish or Norwegian twist, add a dollop of lingonberry jam. But all leftover meatballs are great in sandwiches. Scandinavian baking is getting a lot of attention in the UK right now, and you’re probably aware that cinnamon is an important factor in our cakes and buns. Cardamom is just as popular as well. Kanelbullar – cinnamon buns – are massive in Sweden (and, of course, the dough sometimes has notes of cardamom). A cinnamon bun can be eating morning, noon and night – usually with coffee. In Denmark, Danish pastries are the thing, you might be surprised to learn. But they’re called wienerbrød there – ‘Vienna bread’. If you’ve never eaten a Danish Danish pastry, then go to a bakery there on a Sunday morning and buy a smørsnegl. It’s a taste like no other. Other favourites include kladdkaka, a sticky Swedish chocolate cake, and anything packed with fruit and berries. While we have the same word for bread as you do (brød in Denmark and Norway, bröd in Sweden), our loaves are quite different. We love rich, dark rye in any shape or form. Rye bread, rye buns, and rye grain thrown into many different dishes. Crispbread is delicious and healthy – and not the same as what you buy in the supermarket here in the UK. Check out the vast variety that we sell in the shop. Bread can also be a sweet treat – try vörtbröd, limpa or franskbrød. Yes, we admit it. Some of those horror stories you’ve heard about Nordic food are quite true. And if you want to give them a go, we can help. Surströmming is Swedish fermented herring, popular in the far north where crayfish aren’t as plentiful in the summer. It actually tastes amazing, but smells really bad. We advise you to open the tin outside. Lutfisk is cod preserved in lye, and eaten in Norway at Christmas. To British eyes it looks a bit like tripe. It’s on sale during the festive season. Hákarl is Icelandic fermented shark, buried for weeks and hung for months. It’s the very definition of ‘an acquired taste’, and not on sale in the UK. Sadly or happily, that’s for you to decide! ‘What can I use instead of…’ is probably the most common question I’m asked when it comes to Scandinavian recipes. ‘What is this spice called in English’ is the second (I’m also asked to translate from English to Scandinavian languages for plenty of homesick Scandis, too). Sometimes the answers are not that simple, so here are some of the most common ingredients we use for Yuletide cooking, along with their names in Danish, Swedish and Norwegian. Anything we need to add here? Let us know! In Denmark and Sweden, the word for caraway sounds similar to cumin, so it is often translated incorrectly in recipes (cumin itself is spidskommen or spiskummin). We use caraway seeds a lot in breads, as well as cheeses. It’s said that the Vikings first brought this spice back from Constantinople (now known as Istanbul), but there is little to support this idea. However, around 1300, a Danish monk used cardamom in a cookbook influenced by Moorish recipes (Libellus de arte coquinaria), which is the earliest evidence we have for the spice’s appearance in Scandinavian cooking. Today, we use cardamom a lot, including in the dough for our renowned cinnamon buns. I always buy the little seeds and crush them in a spice grinder for maximum flavour – it beats the pre-ground variety hands down, and really lifts the flavour of the buns. Some cheaper varieties of cinnamon are made from cassia bark, which contains high levels of coumarin (not good for you in high doses). If you can, go for high-grade Ceylon cinnamon instead, which has lower levels of coumarin and a better flavour. Cloves are used whole in aquavit and mulled wine, and sometimes on Swedish Christmas ham. Crushed cloves are common in biscuits and cookies. In Denmark at Christmas-time, windows are often decorated with fresh oranges studded with whole cloves – a great way to bring a wonderfully festive scent into your house! The word krydd (spice) sometimes prefixes the word for clove in all three languages. We use dill a lot to give a lift to salads, fish or chicken. Crown dill (where the herb has been allowed to flower) is used for its strong flavour at crayfish parties. That variety is quite hard to get hold of outside Sweden, but you can always grow your own or use fresh dill instead. We use fennel seed mainly in bread, both for loaves and as a flavouring for crispbread. Ground ginger is commonly used in biscuits, cookies and cakes. Whole dried ginger is essential in mulled wine, but fresh ginger is actually not that common in Scandinavia. These orange berries, which look a bit like plump raspberries except for the colour, are found in the wild and are almost impossible to cultivate artificially. They can’t be picked by machine, only by hand, and even that is tricky as the berries burst easily. Cloudberry season is around three weeks long, so that only adds to the cost and scarcity of the fruit. Frozen cloudberries are much easier to get hold of than fresh, but they are still expensive. Most Scandinavian shops stock cloudberry jam/preserves, which can be substituted for fresh berries in almost every recipe. In North America, cloudberries are often referred to as ‘bakeapples’. The cloudberry is very tart and pairs very well with apples, strong cheeses and vanilla (the jam is particularly wonderful heated up and poured over vanilla ice cream). To replace this flavour in recipes is hard, and a tart raspberry is the closest ingredient in taste. Like cardamom, the origins of saffron’s arrival into Scandinavia are unclear. Some say it came via ancient Asian trading routes, while others think it was brought northwards from France and Italy. Regardless, saffron in Scandinavia has always been used for special occasions only, most likely because of its high value (if you’re shopping for it in Scandinavia, it’s probably kept behind the shop counter or till). However, it is an essential ingredient at Christmas time for Lucia buns. We commonly use ground saffron, but if you are using strands, grind them well first. To intensify the colour, soak the strands in warm water before using. Northern Scandinavians have lingonberries in their freezers throughout the year, while fresh ones are picked in August. The berry is small, red and tart, and found in abundance in Sweden, Norway and Finland. From the same family as the cranberry, the tartness of a lingonberry lends itself well to being served with meat (it is most famously served with meatballs). Lingonberries can also be used in cookies and cakes – pair them with something quite sweet, as they are really quite sharp in flavour. If you can’t get hold of lingonberries, substitute with raspberries for sweet recipes, or cranberries for savoury dishes. Scandinavians have been preserving food in salt for centuries, so it’s not surprising that we have a love for using it in anything from well-seasoned savoury dishes to sprinkling it on biscuits or cakes. Not all salt is equal, but if you ever spot a brand called North Sea Salt Works, buy it. Sea buckthorn grows wild across Scandinavia, parts of the UK, parts of Canada and as far east as China. It is quite unpleasant to eat raw, and some people find the smell of the fresh juice offensive! However, when sugar is added, the flavour complexities change. It is brilliant in jam and desserts. It’s also good for you, being rich in vitamin C and carotenoids. We use this in mulled wine and also in some Christmas breads and biscuits. You can substitute with normal dried bitter orange peel, but the flavour will not be as subtle. We have two varieties of strawberries: the normal ones from the garden, available in all shops – and then the little wild strawberries. The latter can be found in Norwegian and Swedish forests towards the end of July. Wild strawberries are very sweet, small berries (often less than 1 cm/1/4 inch long). If you have ever tasted wild strawberries yourself, you will know that they are utterly delicious. Most Scandinavian cookbooks use vanilla sugar in recipes, which is a quick and easy substitute for whole vanilla pods/beans. You can buy this in Scandinavian food shops, or make your own by grinding 275 g/2 cups icing/confectioners’ sugar with 2 dried vanilla pods/beans in a food processor or spice grinder until pulverized. Sift to remove the woody bits and use as needed. You can normally just substitute with vanilla extract or vanilla pods/beans too. If you are buying, Tørsleffs is a great brand. The type of blueberries you buy in the shop are called blueberries, of course. The type of blueberries you find in the wild all over northern Scandinavia we also call ‘blåbär/blåbær’, but in English, these are actually known as bilberries. Wild blueberries or bilberries have a delicious sweet flavour and are a lot smaller. If you can get them then go for them – they are a deep blue colour even inside. Bilberries can be bought frozen from speciality shops or online. The Finns became hooked on the flavour of liquorice, used in a lot of cough medicine, at the turn of the 19th century. Someone had the bright idea to add the flavour to sweets, and from then ammonium chloride began to be added in greater quantities (this is the salty flavour also known as ‘salmiakki’). The salty flavour in Scandinavian liquorice is now so strong that most non-Scandinavians can’t eat it. Although, if you become hooked on the acquired taste, you will need the stronger stuff . Use as a syrup or powder in cakes, meringues or ice creams. In Scandinavia, elderflower is used mostly in jams/ jellies, cordials and cakes. The Elderberry is also used a lot in Denmark to make elderberry cordial – a strong-tasting drink which is full of vitamins. Used pickled, cooked and raw, this vegetable is a real staple of Scandinavian food, in everything from salads to dips or hot dishes. If you use a store-bought beetroot/beet pickle, do check if it’s filled with sweeteners. Eastern European and Scandinavian versions tend not to be and therefore give a better result, in my opinion. Fresh nettles have an earthy taste similar to spinach, but with a coarser texture and stronger after-taste. Make sure you wear gloves for foraging and pick only the new top leaves in spring time – nettles in late summer tend to be harsh and tough. Boiling them in water for 2 minutes before using them will kill the stings. Dried nettles are a good, easy option and can be bought online and added to salads or crackers or used as a general flavouring like dried herbs. The autumn/fall is usually the time for foraging for fresh mushrooms – and we like to use fresh whenever we can. During other seasons we use a lot of dried mushrooms, most often the Swedish ‘Kantareller’ (chanterelles) or ‘Karl Johan’ (Steinsopp – Norwegian) (porcini). Not a flour or grain, but such an important part of our store-cupboard that it needs to be mentioned, as they are on the dining table for most meals, especially breakfast. A good homemade crispbread is made with rye, water, yeast and a little salt. You can use my recipe on page 143 or buy them from Scandinavian food shops. It takes a lot of drying in a warm oven to get the homemade ones nearly as crisp as the store-bought ones, as the professional bakers use really hot ovens heated to 400C (750F). A grain-based alcoholic drink, flavoured with herbs and spices. Most people often enjoy as part of a smörgåsbord or with pickled herring or crayfish. See my recipes for easy versions of dill and fennel-flavoured aquavit on page (171). This is a sifted rye from Germany – not as white as white rye, which has been sifted twice. I love baking with this flour, but it is usually only available online (in the UK, try Shipton Mills). You can buy barley malt protein powder or syrup online. We also sometimes use a low-alcohol malt beer in rye bread dough. If you cannot get malt, use normal dark syrup for rye bread instead. Used in porridge, granola, muesli and baking. We also eat raw oats with milk for breakfast. Oat flakes (jumbo oats) or cut oats are favoured, and we don’t really use oatmeal. Some recipes call for potato flour to thicken a sauce or a dish. You can buy it in speciality food stores, especially Scandinavian, Italian and Polish. Once potato starch is added, the dish should not be allowed to boil (especially in fruit-based sauces, as these will go cloudy after boiling). You can substitute with cornflour/cornstarch, but if you need a less cloudy result, arrowroot is the best thing to use. I love using rye flakes in granola, flapjacks and porridge (mixed with normal oats) for their nutty flavour and a good bite. Available in health-food stores, they take longer to cook and are quite chewy. If you are using oats in a recipe, consider mixing 80% oats and 20% rye. You can’t work your way through Scandinavian food without encountering rye flour. Wholegrain rye is common in supermarkets – it’s very strong and hearty, and is great for baking dark rye breads. Wheat flour cannot just be replaced with wholegrain rye, though – it has less gluten than wheat, and it does not stretch the same way. You can experiment with replacing 10% of the white flour with rye, then increase the amount a little more the next time. In Sweden and Denmark, rye flour mixes are very common. They’re usually 60% white wheat flour and 40% light rye (type 997), sifted together. Make this at home by mixing the same quantities. There are two kinds on the market – the whole rye kernel and the kibbled or cut one. You need the whole one if boiling to include in salads or other dishes, while the kibbled variety is essential when making good rye bread, where the whole one would be too hard to use. If you can only get the whole variety, you can chop the rye kernels in a food processor with a few quick pulses (not too much – you only just want to cut them in half). In Danish cuisine, buttermilk often makes an appearance – especially in the summer dish ‘koldskål’ (see page 152). I like using buttermilk in batters for pancakes and in cakes – it has sour notes and is very fresh tasting for summer.